Before you start a pressure cleaning job, it is important to identify all hazards of the job and ensure you are well prepared. It is vital to ensure you have taken every safety precaution for yourself, other people working with you doing cleaning, other people and animals in the area. Airborne objects – cleaning dirty surfaces such as a yard can send debris flying up towards you at great speed – eye protection is a must. Eye protection – always wear safety glasses or a face shield when using a high pressure cleaner, to protect against chemicals, flying debris and spray back. Wear proper clothing that does not restrict movement or vision. For high pressure applications of up to 5000 psi, special safety clothing is available that can resist direct spray from a pressure cleaner. If using engine driven pressure cleaning equipment, use appropriate ear protection due to engine noise. Ensure you wear a respirator/face mask when working around dust, chemicals, paints and other toxic fumes. Hot Water Cleaner or Cold Water Cleaner? Cold water high pressure cleaners can be used with great success in many different applications – using a combination of the water impact, and the use of a cleaning chemical or soap if necessary. Generally, cold water is used in applications such as cleaning tractors, machinery or heavy earthmoving equipment, general maintenance or building cleaning and other areas where grease and oil are not present. When it comes to cleaning applications that include grease, oil or where you are required to sanitize or degrease an area – this is where hot water/steam high pressure cleaners are ideal. The hot water high pressure washer will clean much faster and more thoroughly than most cold water models. At Liam Chawke Electrical, we have various hot water cleaners available including Diesel heated electric models from the Kranzle range, electrically heated models from the Kranzle range (ideal for indoor use and for sanitary/dairy/food/milking parlour/pharmaceutical applications – no fumes, no fuel). 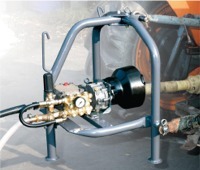 We also have self-contained engine driven and tractor PTO powered washers where no electricity is required. Visit the main Pressure Washer page for details.